Meetings take place on the first Monday of each month in Farr Hall, normally at 7.30pm. Anyone is welcome to attend and we publish full minutes of our meetings. Many thanks to Ian Hunt, Ewen Hardie and Darren Read for completing phase one of this project. 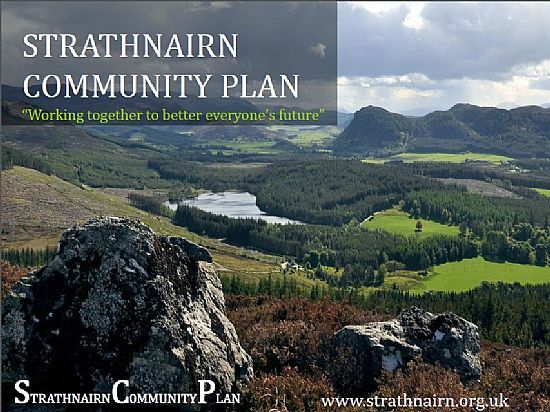 The Community Plan Group was set up in 2011 by the Strathnairn Community Council in order to chart the way forward for our community. • To investigate and evaluate the current social demographics of Strathnairn. • Establish what groups are currently running and operating within the Strath, talk directly with those groups to understand their current needs and future goals. • To hold ‘drop in’ surgeries at both Daviot and Farr Hall, to listen to the what members of the community would like to see happening both now and in the future. • Conduct a questionnaire to see what members of the community would like to see happening in Strathnairn. • Understand the financial resources currently available within the community and the timeline of future resources coming on stream. Understand how the current resources are utilised and managed. The Group is very interested to hear the views and comments of the residents of Strathnairn over a wide range of subjects and facilities. So no matter what your idea or suggestion is, the Community Plan Group would like to hear about it. • Collate and analyse the comments and suggestions. • The findings will be presented to the community. • Ideas and suggestions will go through a period of consultation with the community. • Results from the consultation phase will lead into the development of a Community Action Plan. • The Community Action Plan once compiled will be regularly reviewed and updated.